And then it sort of dawned on me how much more versatile synthetic brushes are (since you can use them for powder, liquid, and cream products) and how much softer they seem than natural brushes, and it made me really want to expand my collection. That's why despite have Sigma's Essential Kit and Premium Kit, I've had my eye on the Mr. Bunny Essential Kit ($120) for a while now. I've tried other synthetic brushes, like e.l.f. 's Studio line, which has quite a few brushes that I love and use nearly daily, and some of Sonia Kashuk's brushes, but I hadn't been able to find all of the brushes that I wanted, namely a big, fluffy powder brush and an angled brush blush, that fit my needs. Since I own Sigma's regular Essential Kit and Premium Kit and like them so much, I figured the Mr. Bunny Kit would be a good option. 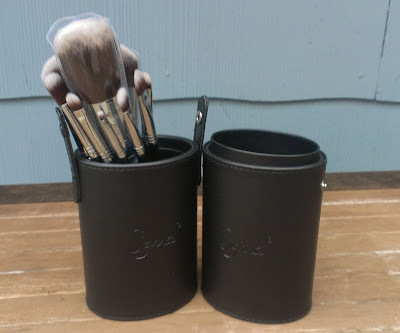 The brushes in the Mr. Bunny Kit all feature black handles and silver ferrules. If black isn't your think, there's also a Mrs. Bunny Kit with synthetic bristles that have light blue handles and shiny pink ferrules. The kit also comes with a black faux leather container that separates into two individual cups to hold your brushes. When the container is closed, it's also really convenient for traveling. Personally, I like it better than the brush rolls that most brush kits come with. My original Essential and Premium Kits are several years old (they're marked with Sigma's old S-__ numbering system), and I have to say that the brushes in the Mr. Bunny kit feel like they're better made than the older Sigma brushes. That's also how I feel about the synthetic kabuki brush kit that I bought about a year ago, so perhaps Sigma has improved their materials or production methods over the years. There are 12 brushes in the kit -- I'm not going to review each one individually because I think it would get slightly repetitive, but I will post photos of each with Sigma's description of what each is traditionally used for. All of the brushes in this kit are incredibly soft -- much softer than the natural bristle Sigma brushes that I own. I think they're also softer than other synthetic brushes I own, like those from e.l.f., Sonia Kashuk, and Sephora, but the difference isn't that great. I do love having an entire set of synthetic brushes -- I have tons of darker cream shadows and blushes that I can apply with my fingers but just look so much better when blended with a brush. I also like the versatility of synthetic brushes. Sigma calls the E40 a blending brush, and it works really well for that, but I've been using it to blend out my concealer under my eyes and it's fantastic for that. And let me just say, the F30 has become my very favorite powder brush in the world. By the way, I've washed the brushes a few times and only noticed a bit of shedding the first time. Now, the Mr. Bunny (or Mrs. Bunny) Kit is definitely a great set of brushes but the $120 price tag is pretty steep. And unfortunately, Sigma doesn't seem to sell all of the brushes in it individually right now. If you want the synthetic E30, E40, E55, F30 or F40, though, you can purchase the travel Mr. Bunny or Mrs. Bunny Kit, which does feature shorter handles but is only $65. Otherwise, if you're on a budget, check out the e.l.f. Studio brush line to see if they have what you need. Those brushes are excellent too, and they're only $3 a pop. Can't beat that. But if you're looking to treat yourself (or have a sister who's willing to treat you -- thanks again, sis! ), I highly recommend this kit. What type of brushes do you prefer? Natural or synthetic bristles? I prefer synthetic brushes too, but I haven't tried Sigma's brushes yet. I've become kind of obsessed with synthetic brushes lately. They're all I'll buy these days -- so much easier to work and so much more versatile.